Here in Forsyth County, NC, community gardens have taken root in neighborhoods, civic groups, faith communities, public parks, schools, and more. These are places where people come together to grow food, create and preserve green spaces, and bring neighbors together, and they are as diverse as the people gardening in them. Forsyth Community Gardening supports the growing efforts of more than 160 community gardens. Explore our website to learn more about Forsyth Community Gardening and discover how you can get involved! Volunteer Opportunities with Forsyth Community Gardening! Forsyth Community Gardening (FCG) relies on an incredible network of volunteers to serve 170+ community gardens with leadership development, horticultural education, supplies, and more. If you are interested in assisting Extension staff with program-wide needs, please fill out our Time and Talents Survey to let us know how you’d like to help! You may select from the opportunities listed there, and/or indicate if you have specialized skills you’d like to lend (for example, media and communications). Training, instructions, and supplies will be provided. If you are interested in working with a specific garden group, please consider participating in our Mentor Program. 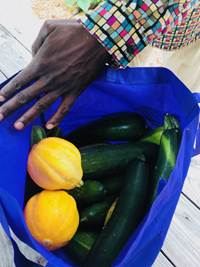 It has been a privilege and joy for Forsyth Community Gardening to support gardeners’ efforts with leadership development, horticultural education, healthy cooking demonstrations, and more. Please check out our 2018 Year in Review for a summary of this year’s milestones and photos of our county’s bountiful gardens and enthusiastic gardeners of all ages. Many thanks to all who have made our community stronger by planting, harvesting, sharing, teaching, learning, and building friendships… in and through community gardens! Ha sido un privilegio y una alegría para el Programa de Huertos Comunitarios apoyar los esfuerzos de los horticultores con el desarrollo de liderazgo, educación hortícola, demostraciones de cocina saludable, y mucho más. Lea nuestro Reporte Anual del 2018 para ver un resumen de nuestras actividades este año y fotos los huertos bellos y los horticultores entusiastas de todas las edades. ¡Muchas gracias a todos los que han fortalecido nuestra comunidad sembrando, cosechando, compartiendo, enseñando, aprendiendo y construyendo amistades… en y a través de los huertos comunitarios!